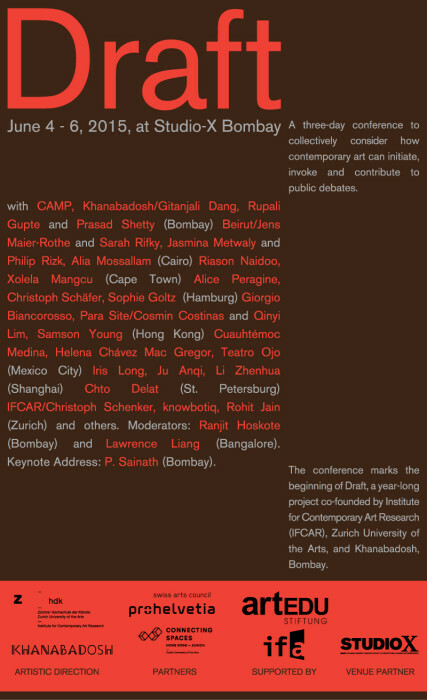 Khanabadosh and Institute for Contemporary Art Research (IFCAR), Zurich University of the Arts (ZHdK), in cooperation with Connecting Spaces Hong Kong – Zurich, present Draft, which collectively considers how contemporary art can initiate, invoke and contribute to public debates. A year-long undertaking, the project opens with a three-day conference in Mumbai, and is anchored in Cairo, Cape Town, Hamburg, Hong Kong, Mexico City, Shanghai, St. Petersburg, Zurich, and Mumbai. The conference, and subsequent project, will convene a cross-disciplinary crew of artists, curators, theorists and anthropologists from these nine cities, and will engage with critical discourses and practices in relation to the public sphere.